The brass over at DC and Warner Brothers have some explaining to do. Since 2013 they’ve been trudging out what’s been branded as the more “serious” alternative to Marvel’s bright pop art blockbusters but have in actuality been mostly dour, pompous, infantile disasters. That Wonder Woman’s rousing optimism emerged from the same stew seemed a minor miracle. Last year’s Aquaman pointed to something of a course-correction, the beginnings of a welcome willingness to embrace camp and goofiness amidst the spectacle. And now they drop Shazam! on us like it’s nothing, a genuinely delightful, colorful, warm entertainment that appears to be the antithesis of everything its franchise once represented. The immense gulf in tone and approach to its predecessors cannot be understated. What is this, humor? Humanity? Fun? You’re telling me we could have had this all along? Surely they had no clue what they had on their hands. Shazam! feels like a promise finally kept, the platonic ideal of everything comic book storytelling and big-screen superhero spectacle is capable of delivering at its very best. Every kid who grew up with some difference that set them apart can relate to the fantasy presented here - the desire to be bigger, stronger, faster, if only to feel more powerful than those who’d make them feel less than. The world of Shazam! is populated by such kids, chief among them Billy Batson (Asher Angel). A foster kid and serial runaway, he’s spent his fourteen years of life bouncing between foster homes looking for the mother he accidentally wandered away from as a toddler. Seemingly at the end of his search and without a purpose, he arrives at a new home and a possible new family. He doesn’t intend to stay for long - he never does. But soon, Billy is transported to a strange cave, where he meets the elderly Wizard Shazam (Djimon Hounsou, pulling double duty on Captain Marvel movies this year). With great urgency, the wizard bestows on Billy all his various powers of the Gods. By saying the wizard’s name, a bolt of lightning transforms him into an adult, caped superhero, played by Zachary Levi. With his foster brother Freddy (Jack Dylan Grazer), Billy discovers all of his new abilities and uses them to do what any teenager would do: mainly, screw around. They test out his powers and upload videos of the results to YouTube. They buy beer and junk food, and use Billy’s grown-up form to get in to strip clubs. They get revenge on the bullies at school. Billy lives out the fantasy of Big, playing through every scenario with an infectious, giddy joy tempered with more than a little adolescent selfishness. With a cast mostly comprised of child actors, the film lives or dies by its presentation of the lives of kids. Shazam! meets and exceeds that challenge, bringing together several pitch-perfect performers who play off of each other with impressive ease. The script tops it off in giving them dialogue that’s radically authentic; this is the way real kids talk to each other, each one expressing themselves in distinct but understandable demeanors. Consider Freddy, who relies on a crutch to walk. His handicap causes him great insecurity and bitterness, but he masks it with dark, painfully honest humor and motor-mouthed awkward confidence. Jack Dylan Grazer sells it perfectly too. Individually the characters are great, but together the picture of family they form is touching and legitimate. Zachary Levi is the film’s magic ingredient. The actor has the look that could’ve made him a great Superman in another life, classically handsome but still retaining a childlike awe in his eyes. That quality comes in handy here, channeling an immaculate approximation of adolescent earnestness and naivete, sometimes verging on outright dumbassery. The wonderfully cartoonish red muscle-suit he wears enhances the whole thing, projecting a confidence that comes naturally from his stature but also magnifying the discomfort-with-my-own-body awkwardness that teenagers experience even without the magic powers. It’s a wonder of physical comedy, a performance I have no qualms labeling one of the best to grace the superhero genre. As much genuine fun as the superheroics are, and the movie absolutely delivers on the traditional heroic bits, what really sets Shazam! above and beyond goes back to authenticity. The aesthetic of its Philadelphia setting is gritty and dirty but never grim or dark, incredibly tactile and grounded to reflect the harsh lives of its characters. Billy and his foster siblings have been through serious traumas and the film treats them as such without talking down to them or putting a neat bow on their problems. In that respect it feels closest in tone to an Amblin production from the ‘80s rather than most of its genre contemporaries, complete with a couple of horrifying visual scares that are guaranteed to be a Judge Doom-level trauma point for a new generation of kids. Credit to director David F. Sandberg of Lights Out and the Annabelle sequel for knowing which edges to not sand off for his audience, making it just dangerous enough without sacrificing the spirit. I haven’t talked about the plot proper much, and not because it’s not compelling. Mark Strong plays the villain well in a slightly different register than he usual gets to hit for these parts. Like the rest of the characters his deal is grounded in real humanity where you understand him and are invested in what’s going on with him. It’s mainly that there’s so much that Shazam! excels at that’s usually treated as an afterthought or secondary that the standard superhero trappings end up being beside the point. Granted, much of those points still rock and are best left unspoiled, particularly the relatively small-scale climax that plays as a refreshing throwback to when big family fare used to be much simpler. The script is also knowing enough to poke a little bit of fun at its tropes, but always from the vantage of taking the emotion that feeds them seriously rather than just calling out ridiculousness. I still am in awe that DC had it in them to make this movie. Shazam! is a Deadpool without the snark and possessing 1000% more heart and joy, and a direct rebuke to the notion that the optimism of old-school Superman doesn’t have a place in today’s pop culture landscape. It’s positive, inclusive, pure, hilarious, touching, and inspiring. 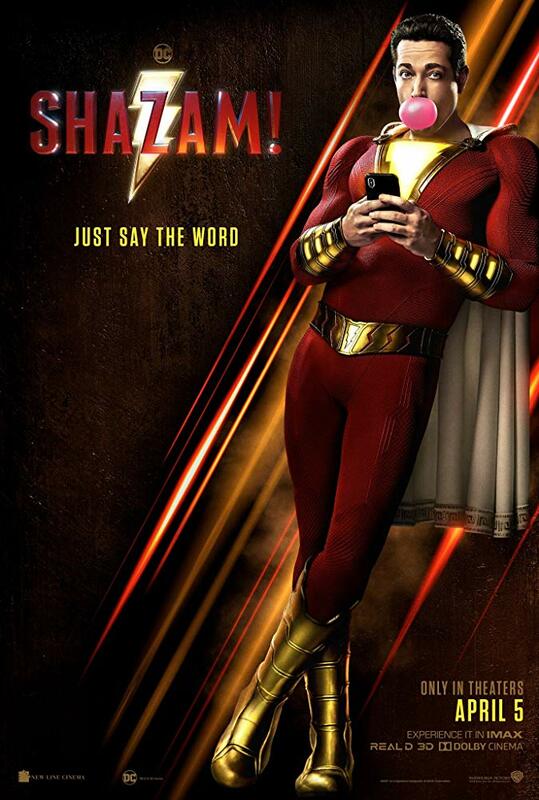 In the recent years of consistent high-water-mark entries in the superhero genre, Shazam! is still able to look slightly down at most of them. I never expected I’d be saying this, but if Endgame wants to be crowned the superhero event of the year, it’s gonna have to step way the hell up.